You see the exact same material you get in print‚ plus some issues include features like video, audio and live links. As the magazine issues are not loaned out, they are always available at any time. Read online or download issues to your computer or mobile device. You must have a current Idea Store library card to use this service. • Print: some magazines allow printing of a single or multiple pages. • View: single or double pages; slide or flip to next page. • Share: send to email, Facebook and more. • Search: text of magazine including adverts. How many magazine titles are available? Idea Store subscribes to over 600 exciting magazine titles, for a range of interests. A selection of popular magazines from around the world are also available with the Idea Store Online Newspaper Service. Zinio for Libraries has merged with RBdigital. 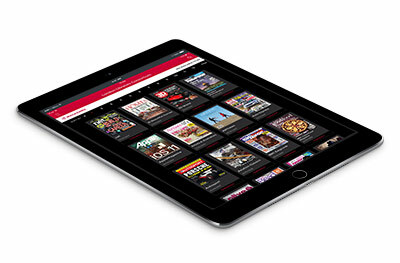 To access your magazine collection, please download the new RBdigital app. Note: Your username and password will remain the same. What do I need to access the online magazine service? • Online magazines from Idea Store require the creation of an account on the Idea Store Magazine site. • An Idea Store library card number. • A computer or a mobile device with the RBDigital app installed. Please note: eBook Readers without a browser are not compatible. Create an account at the Idea Store Magazine site. You will then be able to login with your username (email address) and password to select, download and read your magazines. If you have a smartphone or tablet, the most convenient way to enjoy your magazines is using the RBDigital App, available for iphone/ipad, Android and Kindle fire.